Hello, guys! Hello, boys and girls, and welcome back to Accent Adventure video blog! I’m Robby, accent learning enthusiast, English fluency expert, and your friend above everything else! And, now, I’m back with another Accent Adventure video blog. To tell you the truth guys, I haven’t been publishing on this website for more than half a year now, which is a long, long time. And to be totally honest with you, I wasn’t sure for some period of time whether I was going to continue with this blog or I was just going to let it die a slow and natural death. But, lately, I decided – why not? I just could publish a video every now and then to keep those of you happy who are keen on following my accent learning adventures, right? And currently, as you may guess, I’m speaking with the General American pronunciation. But, funnily enough, some people think that I don’t sound like an American English speaker AT ALL, which is obviously not true. Yes, I know for a fact that anyone can tell right from the get-go that I’m a foreign English speaker, and I don’t sound exactly like a native English speaker, and I probably never will for that matter. But, it’s not even my goal. I’m just trying to sound like an American. I am trying to nail the American English sound such as the distinct “R” sound, right? “Or”, “my problem”, “we’re partners, remember?” – it’s one of my previous videos. That’s why I was using this particular phrase, right? But, I’m just showcasing you what exactly I’m focusing on when trying to sound like an American English speaker. And I know for a fact that I’m getting the general feel of the pronunciation, if you like, when I’m speaking. And I got a comment recently saying that… Let me read it! It was on my other English Harmony channel, right, on YouTube and I received a comment saying, “Why do you have American accent? I thought you were living in the United States.” So, there you have it! Some people think that I have American accent and they can definitely tell that I do sound like an American. There Are As Many Different Opinions As There Are People! Well, obviously, all comments and all opinions are welcome to my YouTube channel, and my blog, and everything, and I’m not knocking anyone for publishing their honest opinion on my pronunciation. But, the reason I recorded this video was just to show you guys that other people’s feedback matters very little. If you’re on a journey to improve your English generally or acquire an American accent, or a British accent for that matter, or you’re just generally trying to improve your pronunciation and make it clearer, and basically you want to make yourself being understood with ease, right, no matter what your goal is, you should take other people’s opinion and advice with a pinch of salt. Focus On Your English Pronunciation And Ignore the Naysayers! Meaning, you shouldn’t take it too seriously because there are people who will think that no matter what you’re doing you’re not good enough. And, then, there are people who will congratulate you on your achievements and they will actually probably try to compliment you no matter what. They won’t even point out your mistakes or whatever. Do you know what I mean? So, the best way would be probably to give a very constructive criticism so to speak. And I received some of those in the past. It’s basically when someone tells you, “Yeah. You have done well, but here are the things that you should actually bear in mind” and they actually tell you. As a matter of fact, it’s after that comment that I paid particular attention to it. I looked into it. I figured that I was actually pronouncing certain words wrong. And, ever since, I’ve been trying to get them right, okay? So, it just shows you that constructive criticism is the best thing, right? But, when someone knocks you, or someone tells you that you’re doing brilliantly and you’re sounding just like an American English speaker, and anyone could mistake you for a native English speaker, obviously it’s a little bit exaggerated, right? That person is just trying to please you and tell you what you kind of want to hear, not necessarily the actual truth. So, the real evaluation is probably somewhere in the middle. And don’t listen to negative criticism. YOU Are The BEST Judge Of Your Own Pronunciation! Don’t get your hopes up by listening to those who tell you that you’re doing just brilliantly. But, you have to be able to judge yourself. Be a fair judge of your own progress. And, if you think that you can’t correct yourself and that you’ll definitely need feedback provided by a professional, nothing could be further from the truth. You may want to check out this article and you can be a very good teacher to yourself so to speak, right? Anyway, hopefully this video marks a new beginning of my journey on my Accent Adventures. Basically, I was stopped dead in the tracks for a long time and hopefully now I’m going to jump into video production with a renewed vigor so to speak, right? So, talk to you soon! Stay tuned! And bye-bye my friends! Take care! 1 – constructive criticism, which can be a very useful element for improving your abilities, ideas and performance on a certain activity. It is an opportunity to evolve and progress on what you do and is generally well grounded. 2 – Destructive criticism: the goal is generally to simply frustrate you and make you think you’re not good enough to do a certain activity. It is generally not backed up by logic or substance, and the only goal is to belittle you. This last type of criticism should always be ignored, because it does not have any contribution to offer and it will not help you improve or advance. However, the first one is a very great opportunity to pay attention to certain things you have to improve on or reconsider your position on them. It can point you an interesting path that you’ve never realized before or make you rethink your steps. It is generally a very positive component. Anyway, both of those criticisms will always exist, so it’s a matter of knowing which one to take as an opportunity to evolve. 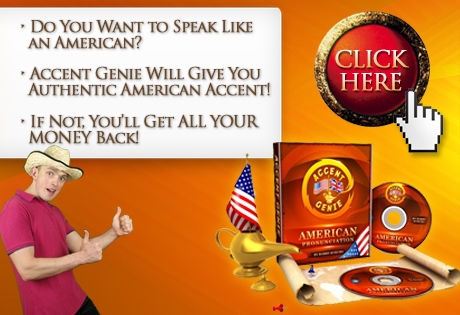 Previous post: Are You Shy, Embarrassed & Ashamed of Speaking in English with American or British Accent?